Turning A Glacier Into A Tuba: Ice Music From Norway Playing frozen instruments requires lots of improvisation. Norwegian musician Terje Isungset has a new set for every performance, freshly made to get the most sound out of each instrument before it melts. 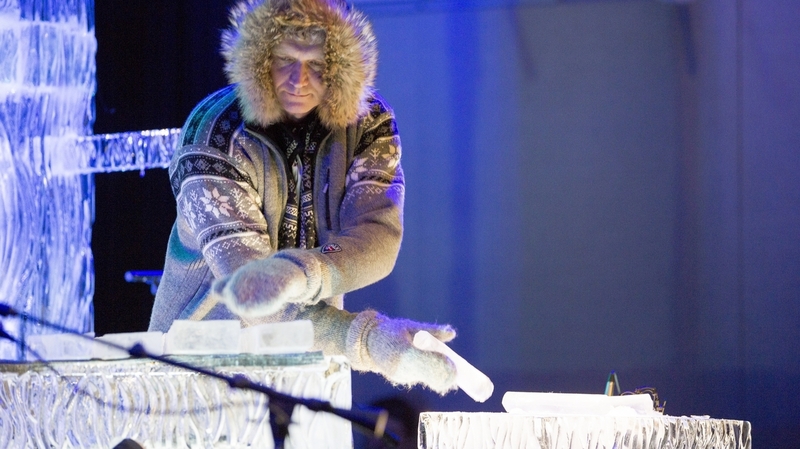 Ice musician Terje Isungset plays the ice blocks at the Kennedy Center in Washington, D.C.
For Terje Isungset, the cold weather in Washington, D.C., this week is no problem. The Norwegian musician was in town to perform as part of the Kennedy Center's "Nordic Cool" series, and he needed low temperatures to keep his instruments in good shape. He has chimes, drums, a marimba and a "tube-ice" (like a tuba). They're all carved out of shimmering ice, harvested from the frozen lakes of Ottawa, Canada, and shipped to the Kennedy Center for an hour of melting music. It's worth the effort, Isungset says, to get the perfect sound. "Artificial ice doesn't have any sound at all, nearly. So we have to try to find lake ice," he says. "But when you come to lake ice, there is only some lakes that have sound, and even if you find the lake there might be just a few pieces that will have a good sound." Bill Covitz is the ice engineer in charge of making the instruments. He carves a new set for each concert and hands the instruments to Isungset just before he plays them to get the most sound out of each piece before it melts. Because the instruments are custom-carved for each performance, every concert presents a unique challenge for Isungset. "Quite often, I don't actually know how my instrument will sound. So I just have to listen to the sound that is being created and try to create music out of this sounds," he says. But Isungset was trained as a jazz musician, and he appreciates the improvisation that is fundamental to working with ice. "If you work like this, then you suddenly can be led into something else — some other kind of music that you did not think of, that you did not plan," he says. "It's like you find a new flower, maybe. A new color." This element of surprise keeps Isungset on his toes, even after 13 years of coaxing music from the ice. If he hits a piece too hard, it will break. That happened during his first set at the Kennedy Center, when he hit an ice block to create a bass sound and shattered the instrument. It didn't worry Isungset; he just used his foot to grind the shards into the floor to create a crunching sound. The hollow bell tones from the ice chimes along with vocalizations from singer Mari Kvien Brunvoll transport the listener to the frigid Nordic tundras where Isungset draws inspiration. But he says his favorite element of ice music is also the most simple. "I think my favorite is if I get a little piece of ice to sing long, like a long lasting tone," he says. "When ice can make a tone that lasts for 10 seconds, I nearly start crying I think it's so beautiful."